Obviously, the Stelvio is included in a score of Gran Fondos, and you can also climb it on days when it’s closed to motorized traffic, like during the Mapei Day. The advantage of that is clear, but you will be sharing the road with thousands of other cyclists (or skaters, hand bikers, etc.). 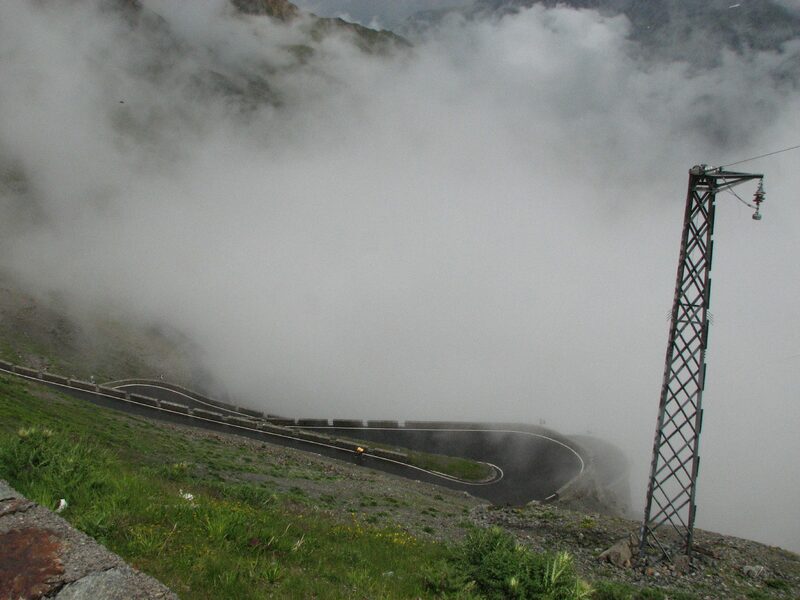 In 2008, I climbed up the Stelvio from this end for the first time – report on that trip here. In 2015 I had a round trip up both ends consequetivley – report here. Starting from Prato, the Stelvio Pass has a length of roughly 25 km and an altitude gain of just over 1,800 meters. Both in 2008 and in 2015, I got on the bike at the Hotel Gasthof Stern in Prato. The first eight kilometers to Trafoi are not too hard, although you’ll see – and feel – inclines of 10%. Shortly before Trafoi you pass through the first 2 hairpins – these are just after the tunnel / gallery between Gomagoi and Trafoi. There are 48 in total from this end – the next 2 you encounter when leaving Trafoi, at Hotel Bellavista. After that, you’ll cycle quite some distance through a reasonably sheltered – tree covered – area, changing between slightly winding sections and series of hairpins. From that point onward, until you reach the summit, you are rewarded with ever more breathtaking views, for which the Stelvio is known so well. Once you reach the usually very crowded summit, you are “treated” with the smell of bratwurst – Bruno’s hot dog and “wurstel” trolley is the first thing you encounter. Report on the 2011 trips here / Mapei Day here, Stelvio revisited 2015 here. There was a reason we booked a hotel near Bormio in 2011: the Gavia, Mortirolo and the Stelvio are around the corner! On paper, the ascent from the south may look less challenging than the one from the north side – just over 21 kilometers and just over 1,500 altimeters. But appearances are deceiving, because the percentages are almost equal and the last two, two and a half kilometers are demanding, devastating if the biting cold wind happens to be a strong head wind. Also from Bormio, you can look forward to a beautiful climb, with similarly numbered hairpins, 40 in this case – number 40 you will find when you leave Bormio and see “BORMIO m 1225” on the wall. The sign says 1256 s.l.m. because Bormio village is at 1225 and you have gained 31 meters up to that hairpin. Passing Bagni di Bormio, you turn away from Bormio and when you’re some 6 kilometers and a couple more hairpins in, you reach the series of short tunnels. Luckily, the bike lights and reflectors for these – some of them were pitch dark – are no longer necessary, because they are now (well) lit, albeit still narrow. After you pass these tunnels, you’ll run into some short, stinging, sections of 14, 15%. However, you also have a stunning view on the most beautiful part of the climb, the series of 14 hairpins – 28 to 15 – snailing up along the rocks. As you climb these, looking back will give you similar views to the ones found in the top half of the other side’s ascend. After looking back one final time, you will be able to catch your breath a bit on the fairly straight and flatter passage towards the final part of the climb. If you’re not faced with a head wind that is, because if you are, it’s not so much fun… Once you get past the chapel, you can already see the start of that “grand finale” in the distance.